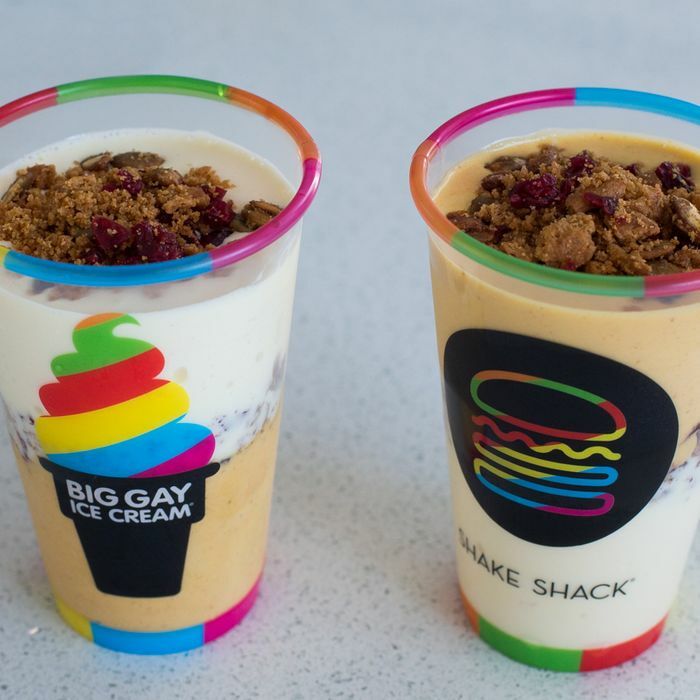 Here’s another blockbuster team-up from Shake Shack, which will collaborate with Big Gay Ice Cream on the “Layer Shakes” you see above. It costs $6.50, goes on sale from November 21 to 23, and the format is a bit fun; the one on the left has got Bryan Petroff and Doug Quint’s eggnog-flavored soft-serve at the base, then some Shack signature frozen pumpkin custard, shake-ified, on top, with a layer of La Newyorkina graham-cracker crumble in the middle. That order is flip-flopped on the right — it’s eggnog shake atop pumpkin custard — and both are 16 ounces. Unlike other very special Shack-borne promos of the past, this one is mind-bendingly taking place at Shake Shack Dumbo and at Big Gay Ice Cream’s West Village shop. Because good things come to those who wait, and sometimes those good things are 100 percent cotton, the first ten folks in line at each venue for all three days will receive a T-shirt commemorating this monumentally jazzy team-up. Those will also be available for $20 a piece, too, for customers 11 through 2,000.